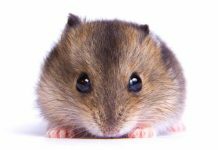 Are you wondering if a Russian dwarf hamster is the right pet for you or someone in your family? 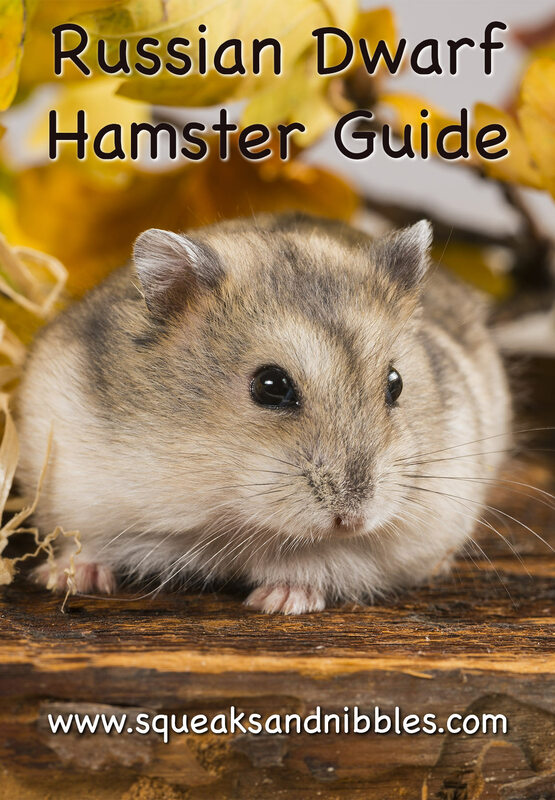 Here we cover everything you need to know about this cute hamster breed, from their personality and diet, to their health and habitat. The Russian dwarf hamster is the cutest little ball of fluff as you’ll see, and the first thing you need to know is: how to tell him apart from other dwarf hamster breeds. 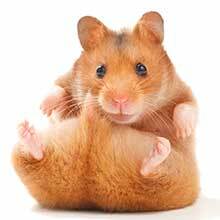 You’ll also see Russian Dwarf Hamsters referred to as winter whites, Djungarian hamsters, hairy-footed dwarf hamsters and Siberian hamster. This can be confusing, but they all have the same scientific name: Phodopus sungorus. If you see a small silvery white hamster with possibly a gray line going down its back, that’s a Russian dwarf hamster. But here’s where this breed gets strange: they change color in the winter months to the white color they’re known for, as long as they are in natural lighting conditions. Other times they can be a brown to gray color. 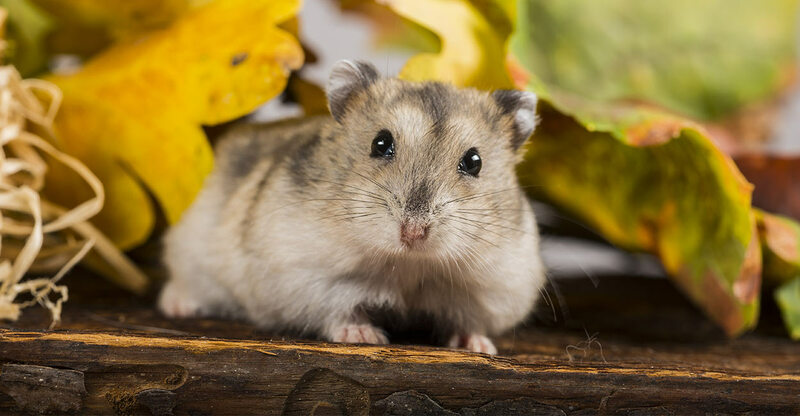 Even though the Campbell’s hamsters are often lumped into the Russian Dwarf label too, they actually ARE a different breed, with the scientific name Phodopus campbelli. Campbell’s typically have a darker brownish coloring, and a darker stripe down their backs. They do not change colors. So now you know when a hamster is a Russian Dwarf and when it isn’t, keep reading to learn all about this adorable hamster breed. Russian dwarf hamsters have a pretty wide background. They come from wheat fields, meadows and birch forests in Dzungaria, Kazakhstan, Siberia, Mongolia, and China. In the wild, they live in burrows underground that are 1-meter deep, which they can access through tunnels. And the reason they turn white in the winter, as you can imagine, is to avoid predators as they blend into the snow. Whether you can get them to turn white in captivity is another story; heavy amounts of artificial light can hinder that color change. Today, they’re popular pets all over North America and Europe. Russian Dwarf Hamsters are shaped like little balls and are on average about half the size of their larger cousin the Syrian hamster, which is why so many people think they’re the cutest hamster breed. Like most hamsters, they’ll live to be about one to three years old. Though they can live longer than that, too. Trying to pin them down by color gets to be a chore, as when they’re not white in winter, they can go to an ash-gray to a dark brown in color. Sometimes they’re pale brown, and beyond that, they can even have pearl, sapphire or marbled coloring. Yet more colors pop up when the Russian Dwarf Hamster is crossbred with a Campbell’s dwarf hamster. Dwarf hamsters are very small, so they can get away with smaller habitats – great if you also live in a smaller house or apartment! A 20-gallon tank is the smallest comfortable habitat for a dwarf hamster. Choose pine shavings instead of cedar, as dwarf hamsters are sensitive to cedar. You’ll need a water bottle, ceramic food bowls, and an exercise wheel. For added fun, use paper towels, toilet paper tubes, or wooden seesaws and other pet store toys to enrich your Russian Dwarf Hamster’s environment. Hamsters generally need weekly cage cleanings. Dwarf hamsters love to dig and burrow, so a large wire cage is a bad idea, as hammie will probably spread shavings everywhere during his digging escapades and could slip between wide wires for a daring escape. A glass aquarium is a great option for housing dwarf hamsters, and you can see our favorite picks here. You’ll need a lid for the cage only if you have cats or another pet you don’t want getting into the cage. Hamsters generally cannot climb out of tall cages, but you may want a lid to be safe. Dwarf hamsters in the wild feed on seeds, plants and the occasional insect, which makes them omnivores. Choose a good rodent pellet diet for your dwarf hamster. Avoid seeds, as your hamster may become selective and only eat her favorite seeds, leading to nutritional problems. 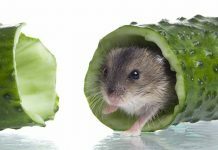 Find out more about the best hamster foods here. You may give seeds and vegetables as snacks, however. Greens should be kept to a minimum, as they can cause digestive issues, but carrots are a popular treat. Remember to keep portion sizes as tiny as your hamster: just the size of one or two raisins at a time! Like other hamster breeds, the Dwarf hamster loves to stick food in his cheeks and then deposit it around the cage for nesting or later snacks. Keep an eye out for these stashes while cleaning so food doesn’t go rancid. Some Russian Dwarf Hamsters also enjoy salt or mineral licks as an occasional treat in their cage. One great thing about Russian dwarf hamsters is that they are typically more active in their day than Syrian hamsters. They are crepuscular, which means they’re most likely to go about their business at dawn and dusk, than in the middle of the night. Russian dwarf hamsters are more alert during the day than the Syrian, and may have random activity at any time. While they’re up and about, they have the potential to be confident and friendly little pals, who enjoy your company. If you take the time to make them games and obstacle courses, they will entertain you with their antics and tiny acrobatics for hours on end. Dwarf hamsters have a wide field of vision, but they are near-sighted and see less well in bright daylight than at dawn and dusk, so make sure to talk to them before just grabbing them. Letting them know you’re near means they will be less likely to bite and may come to regard your voice favorably. Scoop up your hamster and then cup your hands around him, or he will fall. Try for daily gentle interaction so that your hamster can get used to being held. Russian Dwarf Hamsters like company of their own kind, so you might like to think about getting a couple of sisters, or one (fixed) male and one or two females. Hamsters kept together should either be from the same litter, or introduced at a very young age. Unfamiliar adult hamsters are likely to each other as a threat and fight. If you need to introduce two new hamsters, use a clean cage that has been bleached and has new bedding, to create a neutral territory. Sprinkling seeds is a solid way to distract hamsters until they stop regarding each other as strangers. Always keep an eye out for any fighting and separate problem hamsters, and bear in mind even littermates can fight. Russian dwarf hamsters are hardy animals. Like any pet, however, they can be prone to some health issues. Knowing what to look out and when your hamster needs to see a vet will help them make a quick recovery. If you notice your pet is losing fur, it could be due to a number of factors, from friction, to B vitamin deficiency, to parasites or hormonal imbalances. Most of these can be managed, so if your hamster develops a bald patch, visit a vet to find out the cause and how to treat it. Your hamster can actually catch a cold just like us, and it will make him feel rotten just like us! If he becomes sniffly and lethargic, has runny eyes and goes off his food, it’s possible he’s caught a common cold. First you should get him checked over by a vet to make sure it’s not something more sinister, then clean his cage with disinfectant to get rid of those pesky cold germs. Move his home to a warmer spot while he recuperates, and follow any other instructions your vet gives you to help him recover. Wet tail is a disease that causes severe diarrhea in hamsters and needs urgent veterinary attention. We’ve got more information about it here, and because it can become fatal very quickly, it’s important to make sure you know the signs! Since hamsters’ teeth grow their entire lives, it’s important to make sure they have the right diet or toys to chew on. Overgrown teeth can result in drooling and loss of appetite. If you have any concerns about your hamster’s teeth, contact your vet immediately. 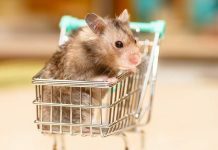 How do Russian Dwarf Hamsters compare with other hamster breeds? Russian Dwarf Hamster are just one of a dizzying array of pet hamster breeds. With so many hamster breeds, you may be wondering about some of your other options, as well. We’ve got a detailed comparison of all the domestic hamster breeds right here. And right now we’ll see how these different hamster breeds compare to Russian dwarf hamsters. Are Russian Dwarf Hamsters the cutest hamster breed? He’s not as big as the 6-inch Syrian, but nor is he quite as small as the tiny 2-inch Roborovski hamster. Similar to the Chinese hamster, he’s a nice “mid-range” hamster, sitting around the 3 to 4-inch range. What about the friendliest hamster breed? With roommates of his own kind, the Russian is far more sociable than the territorial Syrian or Chinese hamster. With humans, both they are typically docile and sweet, placing them firmly in the running as nicest hamster breed. All breeds of hamsters have the potential to be friendly if they’re well-reared and enjoy lots of human interaction, and to become hostile if you don’t socialize with them much. Your relationship with your Russian Dwarf hamster is really what you make of it! Russian Dwarf Hamsters: the best breed of hamster? We think Russian Hamsters a charming little critters, with friendly dispositions and bags of character. They are a great choice if you don’t have a lot of space for a pet, and they don’t require any unusual or exotic care. Like any pet, they need daily interaction to become relaxed and confident around people, and the more you give, the more you’ll get back! Are you a fan of Russian Dwarf Hamsters? How do you think they compare to other breeds? And have you ever had one change color in winter?? Thank you so much, it was so help full to get other people to get to know about hamsters and there life. I really liked your hamster site,I am now thinking about getting one of my own.